The most dedicated followers of Bat-Fashion may remember the cover to Detective Comics #241, showing Batman and a veritable Rainbow of Batsuits. Now, there's a chance that said Bat-Rainbow may come to a toy shelf near you. Now that's what I'm talking about. Sure, it's a literal repaint of the same figure six times, but come on. RAINBOW BATMEN. It's kind of amazing that, even as a joke-set, this didn't get made the first time round. 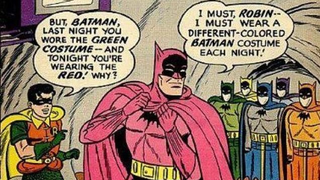 Who doesn't want the pink - err, 'red' as Robin calls in on the cover - Batman, after all? It's kind of bizarre for DC collectibles to go about it this way - even showing the pictures of said unreleased products - but hey, if voting to show interest in Rainbow Batman (who are, awfully, a distant second to the New 52 figures as of writing) is what it takes to get them, I'll damn well do it.